I'm always evolving and growing. Hopefully, I am learning something along this journey of life? Lol! I started tap dancing when I was three years old. I guess tap dance is what gave me my natural affinity for rhythm which appeared when I began playing the bass. I started playing piano at the age of seven followed shortly after with playing the violin. I continued playing the violin through High School Orchestra. I also began writing music soon after starting piano lessons, and a few of my songs placed in classical songwriting competitions when I was still in grade school. I played piano my entire life, even though there were years I did not have access to a piano. The last piano lessons I took were from Arthur Goldstein, and the lessons focused on improvisation and Jazz theory. but because I could read music I secured the Stage Band (Jazz Band) gig at my High School after only playing the bass for a month. 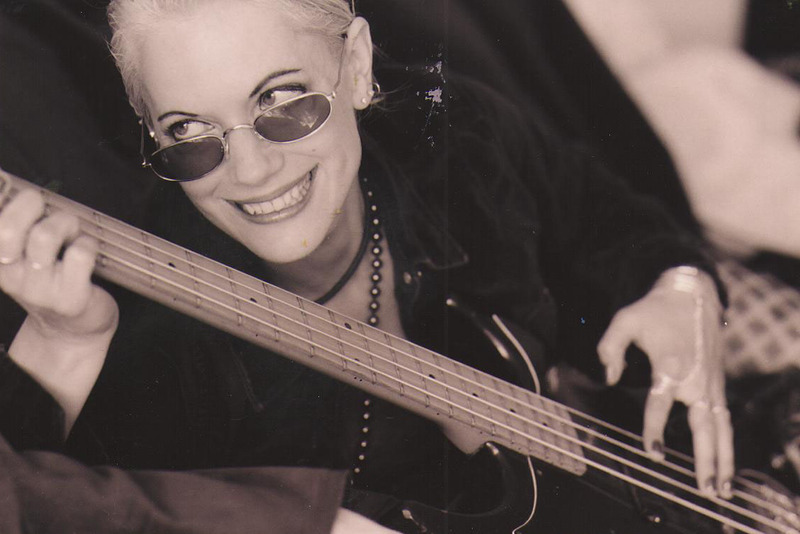 After completing my BA degree from Penn State in Theatre Arts with a Dance emphasis, I then started playing bass again while working on my BFA degree in Design at CCA (California College of Arts). I was fortunate enough to meet and play music with Paul, guitar player and fellow CCA student, who at that time was taking lessons from Joe Satriani. Paul opened my eyes to a whole new style of music - fusion, progressive rock, and jazz. He took me to see and hear great bands and performers including: King Crimson, Steve Morse and the Dregs, Allan Holdsworth, Primus, Frank Gamble (Jeff Berlin on Bass), Roy Buchanan, David Gilmour, Larry Coryell, Mike Stern, Steve Vai, Alphonse Mouzon, Dennis Chambers, Marcus Miller, Jeff Beck, Tony Williams, Carlos Santana, and many more. Subsequently, after this inspiring exposure, I wanted to learn how to solo on the bass. Ergo, I took lessons from Rick Giovinazzo (Music composer - Co-orchestrated Austin Powers, etc.) for three years (because he had taken bass lessons from Jeff Berlin). Rick taught me Jeff's full range scale technique on the bass and he taught me music theory and jazz. Played - The Rock Candy, Off Ramp, The Central. Played music festivals including Rainbow Valley, etc. Music videos were played on Rock Hard TV, and Fox 13 weather. Missing Children's CD -'Wants & Needs' was nominated as best Funk album. Laurie also has 5 CD released, and has licensed music for commercial use. Tours - Played bass for the Jimi Hendrix family foundation Electric Guitar Competition - 1999 - BB Kings - Memphis, TN, etc. I love creating and I'm always writing new songs in all styles. - Laurie's song 'U Really Chose' was included on four compilations promoting awareness of domestic violence, and she played at the Take Back the Night festival at the University of Santa Barbara which also promoted awareness of domestic violence.